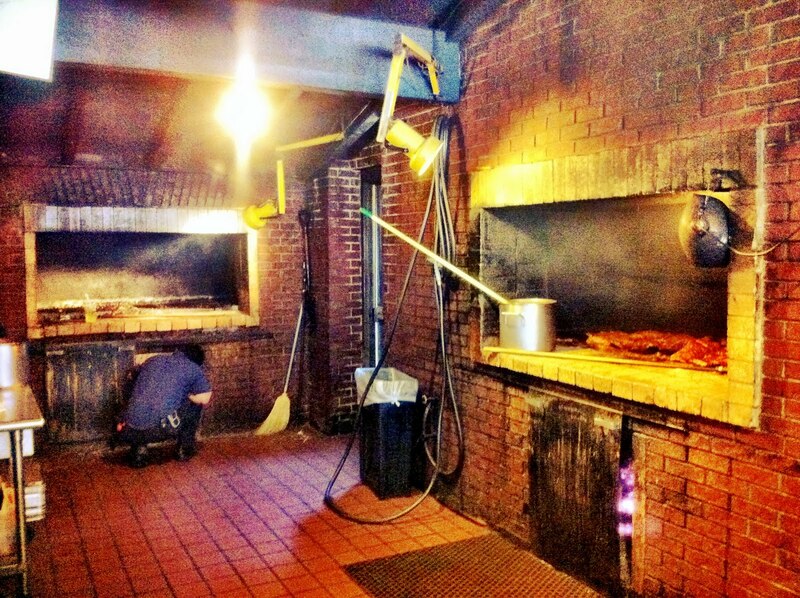 John “Big Daddy” Bishop built the original Dreamland Bar-B-Que with his own hands in 1958. He previously worked with concrete and bricks for B.F. Goodrich, but wanted to create a new business to supply a greater income from his family (1). He decided to build and start Dreamland Bar-B-Que Café, a restaurant that originally sold ribs, sandwiches, and even postage stamps, and served as a drive-in restaurant. The original Dreamland was built in the Jerusalem Heights section of Tuscaloosa, an area that has a boondocks-like feel accompanied by stray dogs and trailers that give the original Dreamland an authentic, old-school feel. 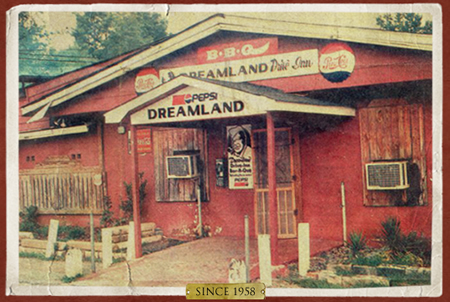 Dreamland was the “dream” of John Bishop Sr., a true ground-up bar-b-que restaurant that was started and operated by the same man until his death in 1997 (2). Dreamland has since become a franchise, selling locations and franchises like McDonalds or Subway. The economic impact created by Dreamland in Tuscaloosa is difficult to measure. The original Dreamland now employs 24 people, with one manager. About $250,000 to $500,000 of the restaurant’s $1,024,000 of revenue spent on employee payrolls and benefits, and the rest is spent on insurance, utilities, rent, accounting, etc. in nearby Tuscaloosa businesses (3). This seems like a relatively small monetary amount generated for the city. However, Dreamland has served as a tourist avenue for BBQ and food enthusiasts all over the nation. David Letterman once called out Dreamland in one of his talk shows (4). Forbes has it in their “Top 50” restaurants. The original is the most authentic, most down-to-earth, most enjoyable Dreamland in the 8-restaurant franchises (Roswell, Birmingham, Mobile, Northport, Peachtree Corners, Huntsville, Montgomery and Tuscaloosa), and provides a substantial, albeit hard to fully measure, economic punch to the Tuscaloosa area. The environmental footprint of such a small place is similarly hard to measure. While a small barbecue restaurant like Dreamland seemingly can only have a very small effect on the environment, it is still palpable. 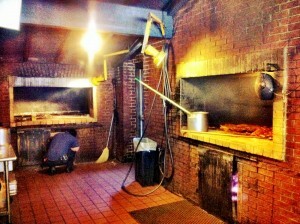 Dreamland uses barbecue “pits” to cook their meat (5). They smoke their meat with hickory wood, commonly used in top-notch barbecue cooking because of the flavor it gives the meat. However, copious cooking by burning any type of wood produces a lot of soot and ash that goes into the air. The burning of wood creates nitrogen dioxide, and the oxygen binds to the meat to a more stable compound called myoglobin that holds oxygen to the tissue in muscle (which is meat) (6). The remaining compound produced from the burning is an acidic one that has negative effects on the environment. Dreamland still uses this old-school method to cook its ribs, and, though the flavoring may be better than it would be with a gas grill and it is cheaper than using filters to filter out the soot and ash released into the air, Dreamland has continued cooking the same way since its conception. EPA-certified wood-burning stoves put out approximately 170 times as much fine particle pollution than gas furnaces, 1.4 lbs/MMBtus of heat output to .0083 for gas (7). Wood burning puts an incredible amount of fine particle pollution into the air. Dreamland keeping their pits at 500 degrees all day long while churning out tons of ribs has resulted in the near-continuous release of smoke, soot, and fine particles into the air for 55 years. The EPA, recognizing the harmful effects of wood burning stoves, recently banned the production and sale of 80% of America’s current wood-burning stoves (8). The environmental footprint is definitely not on the same scale as some of the larger chemical and production companies in Tuscaloosa. However, the price of outstanding ribs, in this case, is a palpable effect on the environment with all the smoke that is produced. There are more environmentally sound ways to cook ribs, but those sometimes come at the cost of a delicious, hickory-smoked flavor.